A former factory complex on the outskirts of Lodz, Poland, that was turned into a prison by the Nazis during the occupation of the country by Germany. On top of all the horrors that the prisoners had to endure during the years of WWII, the place's final moment was an especially horrific blazing finale of an atrocity. All this, and Lodz's plight under occupation rule in general, are the subject of the museum at Radogoszcz, while the outdoor part is a more symbolic kind of memorial complex. More background info: Not to be confused with the Radegast station memorial (used for the deportation of Jews from the Lodz ghetto to Chelmno), this site that is known under the Polish language equivalent of the same name, gained notoriety as one of the largest and most brutal Nazi prisons in occupied Poland. Originally the complex was built as a factory (of which industrial Lodz has so many) in the early 1930s, consisting of a four-storey building and a single floor sawtooth-roofed workshop adjacent to it. Shortly after the invasion of Poland by Germany, the Nazis appropriated the factory and turned it into a prison. Amongst the early inmates were members of the Polish intelligentsia and leadership but also Jews. The former were systematically persecuted for political reasons and many were executed. The Jews were later sent to the Litzmannstadt ghetto or deported to the “Generalgouvernement” established further east (see Lublin and Krakow) in eastern Poland and western Ukraine, while Lodz and parts of western Poland were formally incorporated into the Third Reich. Radogoszcz prison was from then on a male-only police prison housing both political prisoners as well as black-marketeers and smugglers and others who had disobeyed the rules or were deemed “dangerous” to the Nazis. The conditions inside the prison were so harsh that survivor Wladyslaw Zacharowicz after the war recalled being relieved at having been transferred to the concentration camp of Gusen. And that is saying something! The guards were mostly “Volksdeutsche”, i.e. Poles of German descent from Lodz and the surrounding area. Brutality was extreme. New arrivals would be given a welcome beating and guards played sadistic torture “games”. Malnutrition added to the horror and many prisoners did not survive long. In total some 40,000 inmates are assumed to have passed through Radogoszcz during the five years of its operation. The overall death toll is unknown but estimated to be at least 10,000. The single worst atrocity committed here came right at the end. As the Soviet Red Army was advancing fast towards Lodz, the Nazis began executing all remaining prisoners in the night of 17/18 January 1945, beginning in the sick ward. As they proceeded to the next rooms, the guards met with resistance from the prisoners. So they left the building, locked it and set it on fire. Those who managed to jump out of the windows into the courtyard were shot there. About 1500 were killed in the blaze and the executions. Only some 30 prisoners managed to survive, some by hiding in a water tank. The prison guards then all fled westwards leaving the smouldering shell of the prison with its incinerated inmates behind. Most of the perpetrators were never held responsible … as has so often been the case in these contexts. However, the prison commandant, Walter Pelzhausen, was later captured in the American occupation zone after the war and sent back to Lodz to stand trial. He was sentenced to death and executed in 1948. Today, the remains of the burned-down prison form part of a memorial complex. The former workshop building next door (which survived intact) houses the museum exhibitions. The sight is usually rather off the radar of most tourists visiting Lodz, almost like one of those “forgotten camps”, but it deserves to be better known. 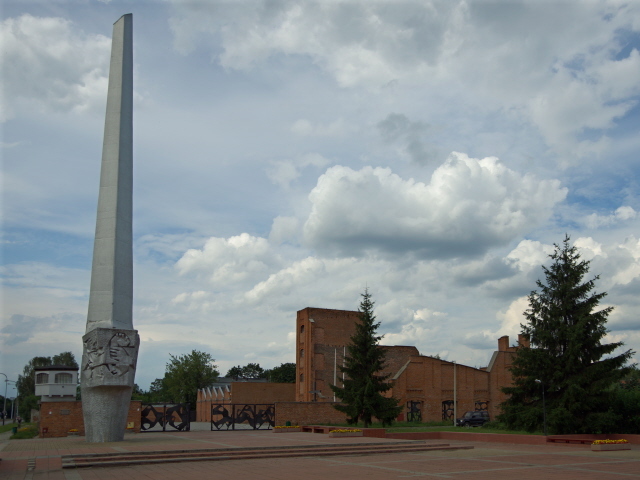 What there is to see: The memorial site is marked most prominently by a 100 foot (30m) high metal spire that dominates the red-paved square outside the former prison. To the left of the entrance gate a watchtower set into the corner of the outer wall gives an indication of the former function of the place. Within the walls is a large courtyard and the inside of the prison wall is adorned with a couple of rather exuberant monuments. Another wall is lined with smaller memorial plaques. To the right of the main gate and the square is a tall black cross and behind it a larger, free-standing monument: a black marble clad square block on a small grassy mound. This is surrounded by the ruins of the former factory-building-turned-prison. Around the black monument are mostly lower brick wall remnants, cleaned up and looking rather nondescript. But to its left stands the only part of the ruin that is still the full four storeys high. The rest obviously collapsed after it had been torched by the Nazis (see background). This remaining taller part of the original building (looking almost like a tower now) is not accessible, but you can see the half-bricked up factory windows on the three higher floors. Behind these, the prisoners would have been housed in miserable conditions. To the right of this tower-like remnant is the low, sawtooth-roofed former workshop building, which today houses the memorial's exhibitions. Its front wall has been reworked as a kind of relief with indications of body shapes protruding out of the red bricks. Inside there are two wings and a central part, which at the time of my visit hosted a temporary exhibition about Auschwitz. The regular permanent exhibition is subdivided into several sections. These cover the history of the prison itself, and especially the final atrocity of the burning of the remaining prisoners in the building. Some of the images illustrating this are very graphic. Also on display is a scale model of the prison complex in its intact state before the burning, some reconstructed bunk beds, as well as some original artefacts such as singed personal effects of the victims. The other sections cover the story of the appropriation of Lodz by Nazi Germany and the renaming of the city to Litzmannstadt. Plenty of photos illustrate the time, including those showing the general segregation: signs marking pavements or benches as “nur für Volksdeutsche” ('for ethnic Germans only'). Lots of German road signs and propaganda posters further illustrate the general Germanization campaign … and there's no shortage of swastikas to be seen either, both in flag form and in black-and-white photos. There's also a war section (which I found a bit dull) and another section about the Jewish ghetto in Lodz, as well as about the whole Holocaust, with photos and artefacts from concentration camps such as Majdanek. Also present here is the almost obligatory display of striped camp inmate clothes and wooden clogs. Most explanatory texts are trilingual, in Polish, German and English in more or less OK translation quality. Some sections are more richly explained in text form (the ones about the prison especially) than others (especially the war section). Only the explanatory texts are translated anyway, many of the texts on the displays themselves (mostly in German and Polish) remain untranslated. Out through the back door is another small courtyard between the museum and some office or administrative building (not public) and here a few pieces of artillery are rather forlornly on open-air display along a grey wall. Overall, the site leaves mixed impression. The sections of the exhibition about the prison itself and those about Lodz under occupation and the ghetto are touching and informative, others are somewhat less convincing. The ruins of the factory are a bit sanitized and if you don't know what you're looking at, they wouldn't seem in any way as dramatic and tragic as their history really was. Plaques outside are also in Polish only. Nevertheless, as long as you come with the relevant previous knowledge about the site, or are prepared to read up all about it in the main exhibition, this is a very sombre part of Lodz's dark-tourism portfolio that is worth the effort of getting there. Location: ca. 2.5 miles (4 km) north of Plac Wolnosci in the “centre” of Lodz (the city doesn't really have a centre as such, but that square is the main focal point at the top of the long main street Piotrkowska). Address: Zgierska 145/147. Details: to get to the memorial complex you can get one of the tram lines (11, 16) that run up here from the east of the Manufaktura complex (see under Lodz) and from the parallel street west of Piotrkowska. The stop to get out at is “Zgierska – plac Pamięci Narodowej”. If you are coming here by car, you have to hope you can get one of the few parking spaces on plac Pamięci Narodowej at the northern wall of the cemetery opposite the memorial (not too unlikely, though), otherwise you may have to drive off a bit to find somewhere. There is no on-street parking anywhere along the main street Zgierska, nor does the memorial have its own car park. Opening times: Tuesdays, Wednesdays, Fridays from 9 a.m. to 5 p.m., Thursdays from 10 a.m. to 6 p.m., Saturdays from 10 a.m. to 4 p.m. and Sundays from 11 a.m. to 5 p.m. I read in the IYP guide that you have to go on a “prescribed tour”, but when I visited the place I was left to wander around on my own. Time required: between half an hour for a cursory look around and well over an hour if you want to read everything (even longer if you can read Polish and/or German as well). Combinations with other dark destinations: If you have your own means of transport (or manage to grab a taxi from across the road outside the cemetery, where they often wait) you can combine a visit to Radogoszcz with the Radegast station memorial to the deportation of Jews – and from there with a visit to the Jewish cemetery. In general see under Lodz. A visit to Radogoszcz can conveniently be slotted in if coming to Lodz from the north, e.g. 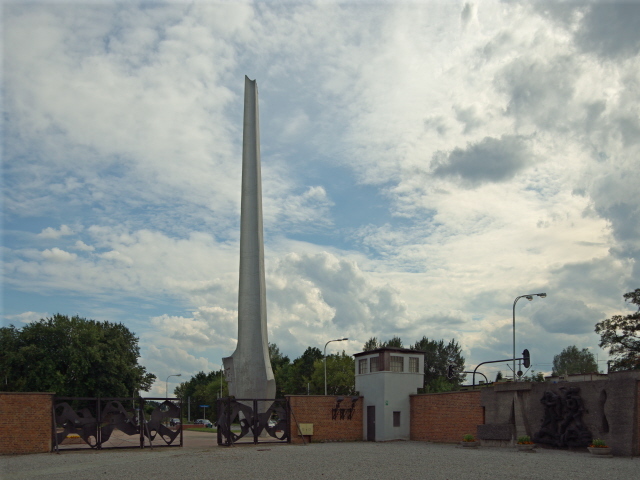 via the death camp memorial of Chelmno, as it is located right by the main 91 road leading from the A2 motorway through Zgierz into the centre of Lodz. Combinations with non-dark destinations: see under Lodz and Poland in general.